Jessie is talking to McCrae and Amanda, and they said that she is the pawn. Jessie has noticed that Helen and Elissa have been distancing themselves from her, and she feels alone. Jessie, now talking to Andy, says that she’s spending so much time with Spencer. and she is wondering if Helen has her back. Andy is telling Elissa and Helen that they should have “better poker face”. She is apparently onto them. and they should act like “besties”, in Elissa’s tone. Helen and Aaryn were talking about Judd when Jessie answers. Helen casually throws her name out as the person who might’ve been wanting Amanda to leave the house. Helen and Jessie are now talking while playing pool. Jessie feels like Helen is becoming more distant from her, and she doesn’t know why. Jessie says that she has only been loyal for the last three weeks, and she wants to get Amanda out of the house… Jessie is trying to get her game blown up. She is now telling Amanda and McCrae. Amanda is now telling Helen and Elissa that Jessie had thrown their names under the bus. They are now confronting each other. Helen and Elissa said that they didn’t make this, and Helen is saying that she is going home today. Jessie and Helen are now talking again at the chess table. They are now talking about last week. Helen apparently does not remember the plan, to get Amanda out… she does not have “any recollection” of it. and Helen and Jessie are still arguing. Jessie feels that she is lying about it, and Andy knows that Jessie is right. Helen has gone up to him to get Amanda out, and now Helen is just “back-pedaling”. Wow. Arguments! Jessie is telling Aaryn that Helen “f-worded”her. Aaryn said that she couldn’t hear it in the room. Helen and Aaryn and McCrae and Amanda are in the same room. Now Jessie is listening at the door. Oh, Elissa is inside, too. Jessie heard through the door, and told Andy that she heard what they were saying. Andy informs his crew that she knows everything. Aaryn feels bad now. Aaryn is freaked out that Jessie could ruin her game, and that she shouldn’t have been “talking so much”. Jessie is now talking to Spencer and Ginamarie. She tells them that she is going home. She is saying that it’s a “liar’s den”, in this House. Jessie tells Ginamarie that she Aaryn always talks about Ginamarie behind her back. Ginamarie knows. Apparently, Jessie is going to blow-up the house. Ginamarie and Aaryn are arguing now. Aaryn says that she won’t sit there, listening to ginamarie, and Ginamarie is being cool. Aaryn is now leaving, saying that she’s annoying, and she wants Aaryn to “big-girl” in-front of her. Aaryn wants Ginamarie to get the “__” away from her. She wants Ginamarie to go. Ginamarie calls Aaryn a psychopath. McCrae and Jessie are up in the HoH now. We are now talking to the HouseGuests! Andy says that Judd leaving, was like “a huge presence was gone”. Helen thinks that some big moves have already been made… like Judd, leaving. she is telling her to “Hold on tight”. Jessie says that she misses her Mom and family, her last offer, she will be loyal and will fight with her alliances, and they are like a second family to her. Spencer says that everyone is great, and he wants to fight with them all in the season longer. Andy says that she looks “gorgeous”, and she says to everyone “Take care of yourselves”. I think Andy is rying. Jessie is talking to Jessie now. She wanted to make an impression is some way to blow some people’s games up, because she knew that she was going home that week. Jessie wanted a buddy, or a showmance (audience laughs, so does she), and she felt that she struggled to “fit in”. Jessie says that it will be really awkward to see him in the House, because he blamed her for him leaving. Helen says that they can be friends, hopes to see her on the other side. They will face off the podium, and will hear songs, and it will be about Veto, HoH, or Have/Have-Not. Press the button to the correct answer, you move on. Thanks for reading! I hope you guys liked it. Talk to you all next time! P.S. THANK-YOU SO SO MUCH FOR 808 HITS. WOW. THANK-YOU. BB15, Episode 4. SPOILERS AHEAD. 1st-Year Anniversary! This is my Play-by-Play or whatever you call it on tonight’s episode of BB15, episode 4. It begins! I really hope that Nick can persuade the people to vote out David! Honestly! I don’t like that guy. Amanda is really cool! I think that she should work with Elissa and Andy. … Aaryn, okay, really don’t like her anymore. They were supposed to WAIT to drink the wine with the Have-Nots! What the actual heck. “Two-faced”? Yeah? That’s Aaryn. Sorry to spill it to yah. DING DING DING Andy is right! Aaryn is the head of the snake. WOO GO AMANDA! Go talk to the poo Jeremy. Someone needs to give Jeremy and his “gang” and good talking to. Bring in an old, tough houseguest and show ’em who’s boss. They just need to grow up. I’m so sick of them. I used to like Aaryn, but now I’ve learned that there is SO much more behind that face. and Jeremy, I didn’t really like him before, but now I really don’t like him. Ugh. These people need to go. Please vote out DAVID, THANK-YOU. The other side of the house against these guys need to rebel! Get rid of these bullies and liars. “Sharpest botox needle on the tray” ohmygoodness Amanda. “No-one comes between me and my BB game” lol Elissa on her eviction plea. DAVID I hope that he goes. I’m sorry, David fans. “Pin drop” Julie- soo true. The room was deadly silent when David left. … VETO COMP NEVER SPELT A WORD I remember it. I was wondering… who does the commentary for BB? Like the texting parts, like when voting for stuff via texts. “ALRIGHT, I’M MOVING ON” lol Julie. No-one could hear, maybe the wind? HoH: Big jug, or small jug? I would’ve tried for the small jug, I think. Bigger scooper. Wait, who becomes the HoH, then? If you’re in partners? That part had cut-off for me. Nevermind, the winning pair must decide who gets to be HoH. So either one of them. That’s it, folks! I hope you enjoyed my Play-by-Play. Feel free to ask any questions on my opinions, thoughts, or about the episode. Or comment among yourselves! THANK-YOU SOO SO MUCH, YOU GUYS! I REALLY DO APPRECIATE IT! AND 341 HITS? THANK-YOU SOO SO MUCH! 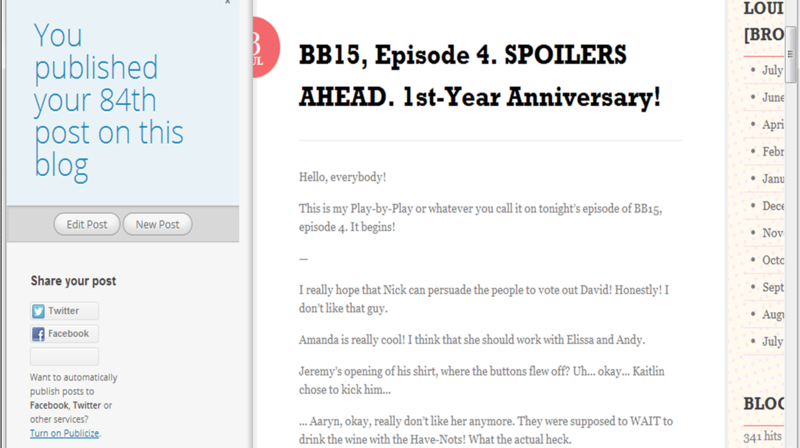 BB14: Contains Spoilers for People Who Haven’t Watched This Thursday’s Episode Yet. Man oh man. That was a tense episode for me. I think that Danielle should’ve gone home because she was the last player remaining on Dan’s team, and that being said, if she went home, Dan would go home too, and there would be only three teams left because one would be eliminated already. I don’t mind Dan and Danielle, but still. I would have liked Jojo to stay because Britney’s team is my favourite. Janelle pisses me off and I don’t mind Boogie right now. Should they remain as Coaches? Or be thrown back into the game as players? Personally, I dunno. I want them to remain as Coaches, but if one of their players goes home, and they were the last ones, that Coach will hafta go home as well. But, arguably, if the Coaches are back as Players, they could very well STILL be allianced with their former Team Players and if that allianced member were to go home, they could still remain in the game for a period of time. :] Gotta think about the advantages and disadvantages of this voting, vote carefully you guys! TOMORROW IS THE LAST DAY of DayCamp with the kids. Talk to you guys later, okay? Thanks for sticking with me + the 34 Views. :’) Means the world to me. THEY USED TO BE $8.00, TOO, but my Mom refused to buy ’em. I’ll go and buy ’em tomorrow. 🙂 They were sugar cookies with pink sprinkles on ’em. 🙂 Yumzers! Tags: 2012, 50 cookies for $5.00!, Americans, BB14: Contains Spoilers for People Who Haven't Watched This Thursday's Episode Yet., Boogie, Canadian BB, Dan, Danielle, Janelle, Joj, July. 26th, SHANE WON HoH WOOOOO000 :'), tense episode, Voting, Yumzers.